Switzerland - IOM is preparing an urgent appeal to donors in response to a migration/refugee emergency unfolding in Yemen and Djibouti, impacting across the Horn of Africa region, including Ethiopia. The initial amount of the appeal will be in excess of USD 10 million, according to IOM Director for Operations and Emergencies Mohammed Abdiker. “We are currently getting hundreds of migrants deported to Djibouti. Our Obock (Djibouti) centre cannot cope with the numbers. Nor can our voluntary return programme. We believe that another 3,000 migrants may be deported to Djibouti in the coming days,” said Abdiker. “Djibouti has become the epicentre of these relatively unknown, but yet complex, bi-directional migratory flows across the Red Sea and Gulf of Aden, with around 500 migrants crossing daily,” observed IOM Director for East and Horn of Africa Jeffrey Labovitz, during a visit to Djibouti this week. According to Labovitz, the migrants include men, women and children, many of whom are vulnerable on a journey that expose them to extreme climate conditions and unsafe land and sea transport. The largest group are from Ethiopia’s Oromia and Tigray regions. They include unaccompanied child migrants, who account for almost 30 percent of the migratory flow into Djibouti. The Migration Response Center (MRC) in Obock managed by IOM in collaboration with the Ministry of Interior is currently hosting over 600 stranded Ethiopian migrants (among them 86 unaccompanied migrant children and five women). 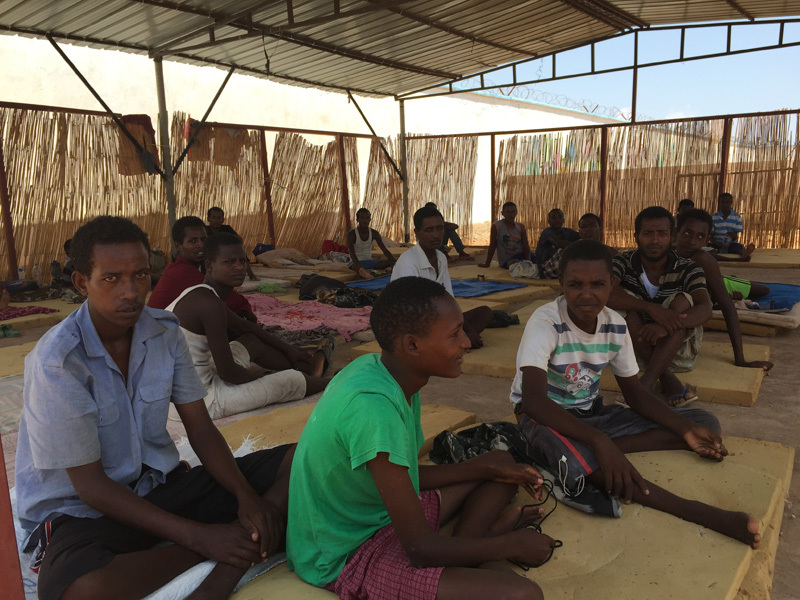 They were deported from Southern Yemen to Geherre and Khor Angar, 30 km from Obock, Djibouti. They suffered badly in Yemen and on the journey to Obock and have asked IOM for voluntary return assistance to Ethiopia. The MRC is now filled to capacity. Following the arrival of a boat on 5 October, another 314 migrants are now being housed in tents outside the facility. In recent weeks IOM supported the Ministry of Health in containing a severe diarrhoea outbreak among migrant communities in Obock. “The situation is very worrying for a small country like Djibouti, which has always responded to humanitarian crises in the region. But it could soon be facing a massive surge of migrants, given the current context,” added IOM Djibouti Chief of Mission Lalini Veerassamy. IOM also has been monitoring conditions of migrants in detention in Yemen, including a recent outbreak of cholera. It believes that over 4,000 mainly Ethiopian migrants are being held in overcrowded facilities with inadequate care. Deportations have swelled the number of new arrivals in Djibouti, against a backdrop of an estimated 10,000 migrants, mostly Ethiopians, arriving in Djibouti every month. IOM Regional Director for the East and Horn of Africa Jeffrey Labovitz will brief media on the emergency at the Palais des Nations in Geneva, Salle III, at noon CET today.